Svitlana is here with a focus on You Are stamps set, which was released this month. Today I will share three cards made using this set. The set is mostly a sentiment one and for the first card I wanted to give more attention to sentiments. Sentiment stamps set are usually used combined with some other ones, but I like finding the ways using sentiments as a role player (or I should say – players) of a card. So for the following card I decided to make a shaker that contains sentiments as “shaking” elements. I white embossed or stamped in black (using Jet Black) different sentiments on pieces of colored cardstock. This is the great way to put in use at least some of those scraps that are laying around waiting when you use them. Next I created a frame, first inking a piece of white cardstock sized a quarter inch less then my card base using a bunch of inks (Midnight Violet, Dusk, Evergreen, Caramel Toffee, Mango Smoothie and Ruby Red) and then die-cutting a frame out of it. 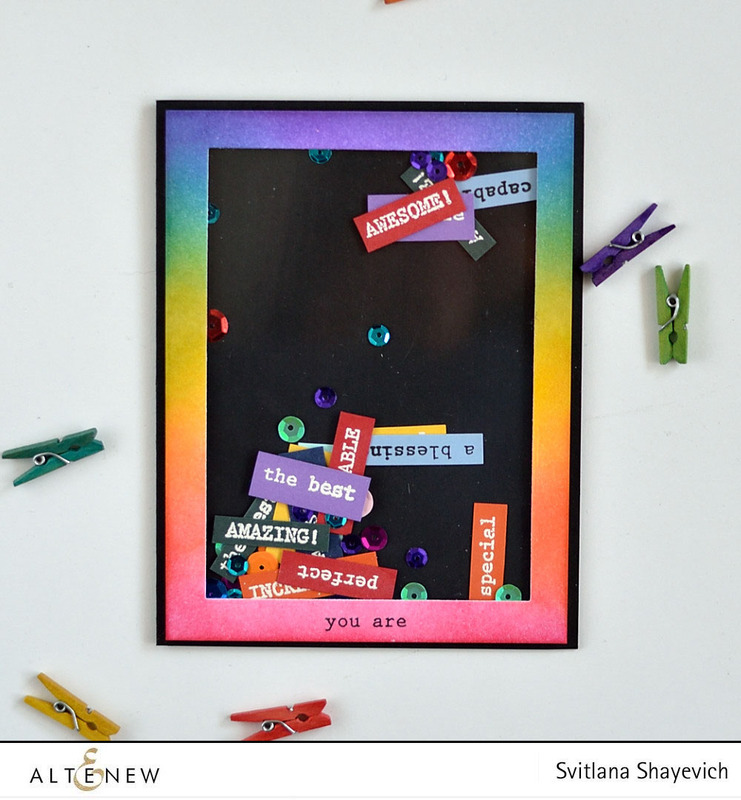 I stamped a simple sentiment “you are” in the middle of the bottom part of the frame and assembled the shaker – putting all sentiments inside along with several sequins. Black was my color of choice for the card base as all these colorful elements stand up better in contrast with black. You Are stamps set is mostly a sentiment one but it also has two beautiful foliage images. So for the next card I played more with them. First I cut a card base and a panel sized a quarter inch less from grey cardstock. 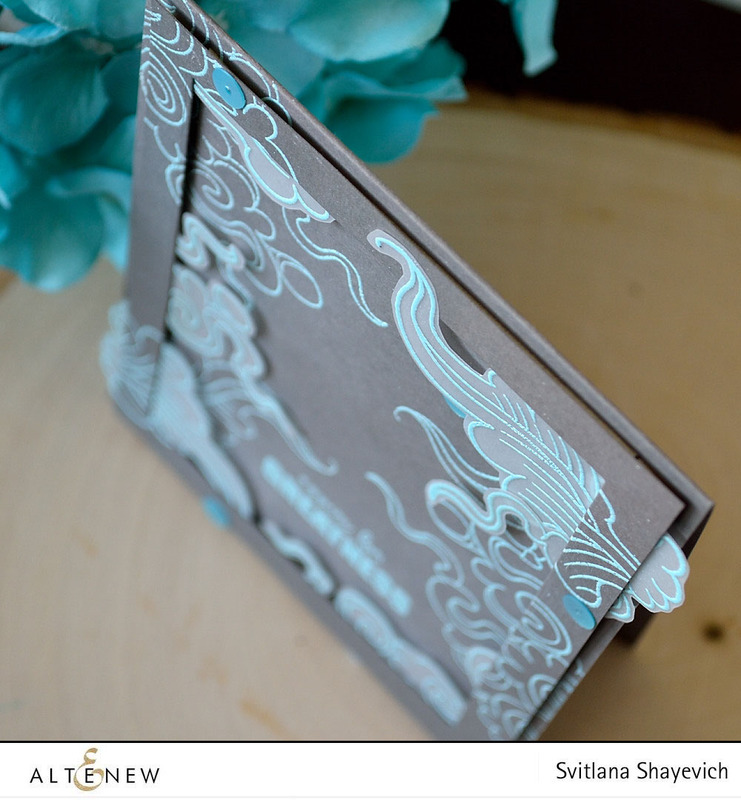 Next I embossed in light blue color foliage images directly on the card base and on the panel exactly on the same place. Along with embossing the same images with the same powder on vellum and hand cutting them. Embossed the sentiment between embossed foliage images. Then I cut a frame from the panel and started assembling the card. By adding vellum foliage under and above the frame which I adhered to the card base using dimensional adhesive. At the end I got a card that reminds a bit an undersea world (although I was not going for this look :) ). And the last card is a one-layered one. First I cut and scored a card base from Classic Crest Solar White cardstock. Next stamped foliage in different colors around the card base. Stamped a sentiment using stamps from Super Script stamps set, applying corresponding ink colors on parts of the sentiment to stamp inside of a foliage image with the same color. On this point I did not care about what color is outside of the foliage images. Then I cut foliage masks from masking paper, masked foliage and stamped the sentiment using black ink. I stamped exactly over it, using MISTI, so black covered all multi-colored parts of the sentiment outside of the foliage images. To finish off the card I added sequins of corresponding colors and covered parts of the sentiment that were located inside of the foliage with Glossy Accent, to make these parts pop a bit. I’m glad my cards inspire you! Beautiful cards! The You Are shaker card is my favorite! Thank you, Janet! I’m so pleased you liked them! These are so awesome! Great cards! You’re mind is amazing!! These cards are so creative and fun. Love the shaker idea. 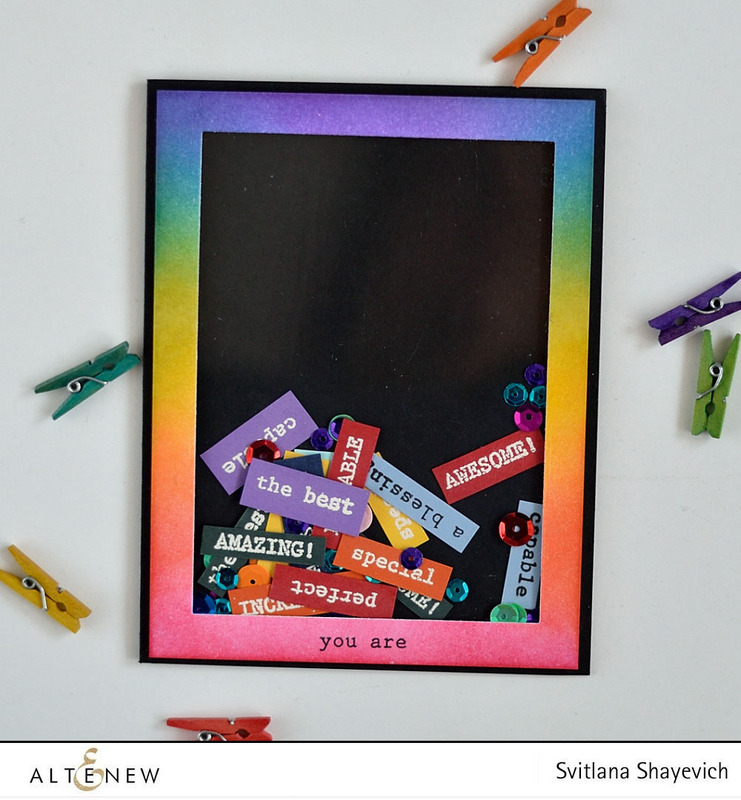 Fabulous cards, Svitlana! I love how you played with this set! Thank you, Barb! It’s a great set! Wonderful, love the colors, love the sentiments. Excellent. Nice cards! Very clever of you to put the sentiments in a shaker window. Oh wow. The shaker is so clever! And I love the colours in your second card and how you have layered the stamped images. 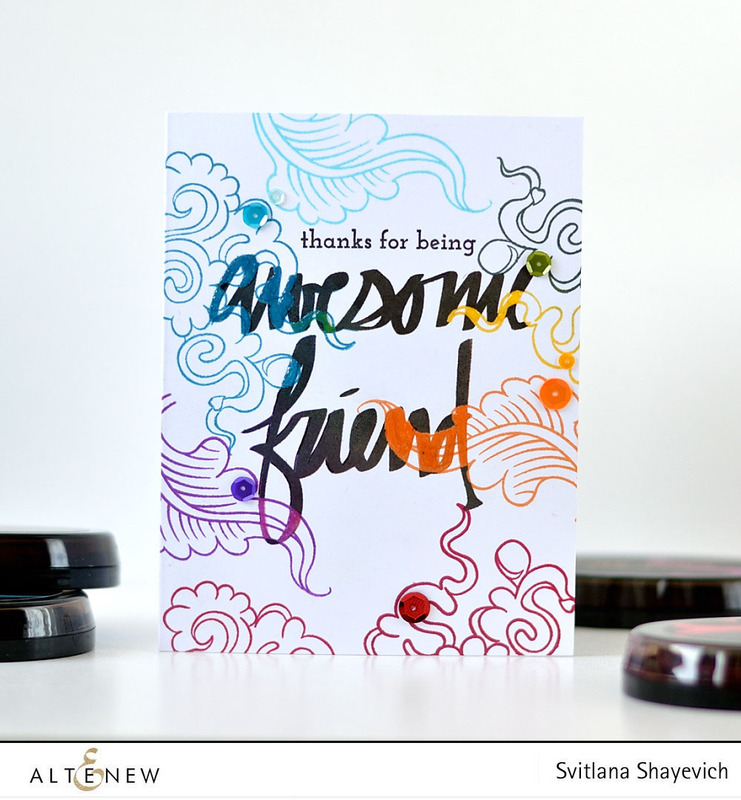 Gorgeous cards Svitlana! I love how fun and creative that shaker card is…great job!